This is a Marvel spin on the classic egg beater carnival ride. While not a particularly dazzling attraction, it is notable in that it is the only Islands of Adventure ride outside of Seuss Landing without a height restriction (children under 48 inches must be accompanied by an adult). Storm Force Accelatron at Islands of Adventure’s Marvel Super Hero Island. You should not see a wait time higher than 10 minutes. Most guests don’t even know that it exists. For the most part you control how fast you spin. 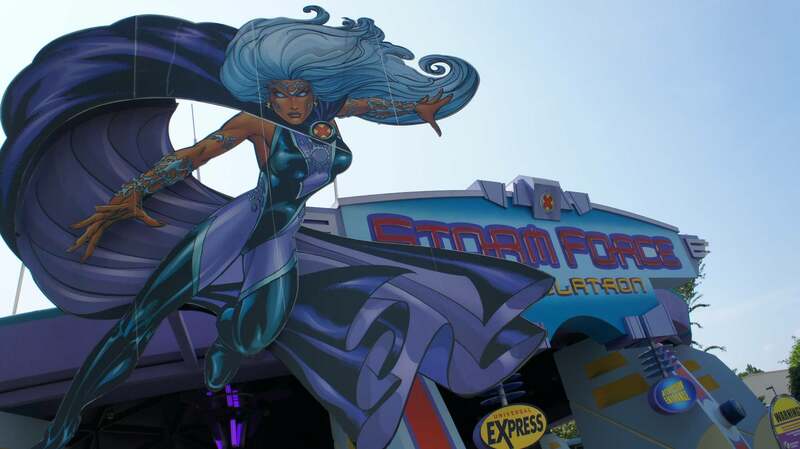 Storm Force Accelatron opened in May 2000, a year after Islands of Adventure opened in 1999. My 9 year old loves this ride! A fun ride tucked away behind the Hulk roller coaster- a breeze to get on and a good compromise for those that aren't ready for the Hulk- tis ride throws you around just enough to really get you giggling hard- make sure your sunglasses and Hufflepuff headband are tightly stowed away as they WILL go flying! This ride is a perfect stop for anyone looking for a way to enjoy some mild thrills and enjoy the park with their kids without being stuck in the "kiddie" areas. Not quite as iconic as Disney's Mad Tea Party, but the same idea as far as the ride goes. We enjoyed teaming up to see just how dizzy we could make ourselves by spinning the wheel in the middle. I consider it a bit of a hidden gem because it's tucked behind the Hulk coaster, so unless you're seeking it out, I could see how it could be easily missed. Another perk? The line wasn't super long and moved quickly. I love rides that spin - so this ride obviously had my name written all over it. Rides that spin get me all giggle-ey, so this is what I like to do... the best part is that it hardly ever has a wait! Where's Wolverine When You Need Him? This ride is nothing new to most seasoned parkgoers. It is a basic spinning ride (as many reviewers before me have noted, most state fairs have something similar) so you know what to expect. For those X-Men comic buffs out there, the theming is not as advanced as it could be. I feel like much more could have been done for a more interactive comic experience (maybe making the line more hands on or put this ride in the dark or something). I love spinning rides personally but this one is as standard as it gets. It was late in the afternoon, we'd ridden The Hulk, Spiderman, Forbidden Journey etc several times. Our feet were tired and we still wanted to ride something but weren't keen on walking around the park one more time It was later in the day and the line was pretty short. As we watched the riders ahead of us on the ride, I noticed not just the kids but the adults were all smiling and laughing like this was the most fun they had all day and no one looked ready to hurl. Ok, well I still wasn't expecting much having ridden these "tea cup" style rides many times before. However, when we got on and starting to spin, we couldn't keep the smiles away! This ride seems to spin a little faster and has a giggle factor that we didn't get on any other rides! We were laughing, smiling, giggling, and not hurling at all! It may not be The Hulk, but when you need a smile, this is it at IOA!